Saturday night in Top City may not be the way we all imagined it months ago when first announced as the Downtown Celebration featuring Kansas on Kansas. But there&apos;s no doubt it&apos;s was a night to remember. Thousands of Topekans, visitors -- some from as far as North Carolina -- and former Topekans who wouldn&apos;t have missed it turned out to the Kansas Expocentre Saturday. They weren&apos;t disappointed. The Wheatheads were in line before 11 a.m. and the crowd streamed in as soon as doors opened at 3 p.m. Food trucks and downtown specialty shops brought great eats. Local musicians added to the atmosphere before Landon Arena opened and anticipation grew. On a video clip of "Dust in the Wind" on the Visit Topeka Facebook page, Rich Drinon said: "Few songs remind us of who we are more than this one..." We agree. Saturday night showed all of us that incredible things have grown from our city, and are happening now every day. 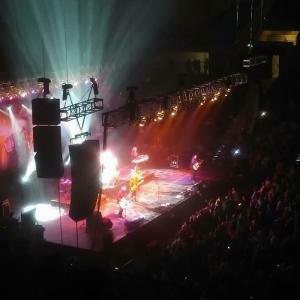 The Topeka Capital-Journal reviewed the show saying the band Kansas sounded "more like Kansas than it has in years." And social media was on fire with amazing photos, video clips and exaltations of awesomeness. #TopCity was even locally trending on Twitter for hours. Explore our social media feeds -- especially Twitter and Instagram -- and our new #TopCity user-generated content page to see if what you had to say caught our attention. See you Monday night at Lake Shawnee for the Spirit of Kansas Blues Festival and fireworks! Not sure how to get there? Head for Reynolds Lodge at Tinman Circle.